The story of the Boston Marathon is quite remarkable, deserving of an entire write-up of its own. However, I wanted to highlight the significance of mile markers. Mile 1 relates to so many facets in life, and one of my favorites, is new beginnings. Marathon Monday was a beautiful spring day … a welcomed reprieve from the brutal winter season. The energy was exciting, and you could feel the hope and see the determination of the runners. However, what was extra special was that Meb Keflezighi won this race, the first American to do so since 1983. This was especially poignant, because of the emotionally personal and astounding pride accompanying our fellow American … a highly anticipated and hoped for morale boost to juxtapose last year’s bombings at this event. It was an inspiring day, to say the least. 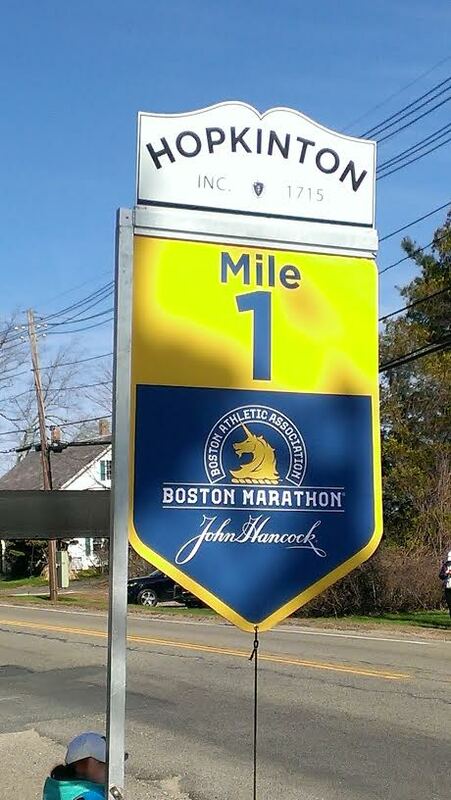 Mile 1 could literally be mile 1 of 26.2, all of the training and mini-victories culminating into the goal of a marathon. However, as I stood atop a stone wall by the Mile 1 marker, I thought of how Mile 1 could symbolize so many different first steps of multiple series toward your own personal finish lines. I had the elevated vantage point of looking down upon the passing runners, as they looked at their beeping pacers. How do you pace yourself? By which mile marker are you in your course? What keeps you motivated when you start to climb, fatigue, or want to cop-out? Lists have been my safety net when I’ve chosen to free-fall from any step on my way to realizing and actualizing my own goals. Maybe it’s my obsessive tendency, but breaking it down into baby steps enables me the personal satisfaction of crossing off those increments … checking off those cumulative sub-goals. Focusing on manageable and doable baby steps, keeps you from feeling overwhelmed by the end-goal as a whole. Baby steps are how I’ve managed to get to anywhere I’ve been, and to complete anything I’ve set out to do. Hey! … Wherever you are, you can always forgive yourself and start anew. Reinvent Yourself!